Add the oil to a large, deep skillet. Heat to 375°F. While the oil is heating, unroll the sheet of crescent roll dough on a floured surface or piece of parchment paper. Use a mason jar lid or biscuit cutter to cut 8 circles from the dough. Fry the crescent roll circles until lightly golden on each side, about 2 minutes per side. Remove to a paper towel-lined plate to drain. In a medium bowl, combine the sugar and cinnamon. When the donuts are cool enough to handle, toss in the sugar mixture to coat. Top half of the donuts with a large scoop of ice cream, about 1/4 cup each. Top with chocolate syrup, caramel syrup, and sprinkles as desired. Place the remaining donuts over the ice cream and squish down to form a sandwich. Eat immediately. Combine your fave ice cream flavors with fresh, soft donuts to make the ultimate ice cream sandwich. When I was a kid, my favorite day was donut day. Now that I’m an adult, my favorite day is donut day. Clearly, not much has changed. I’m taller and I look like a grown-up, but really, I’m just faking it so my mom and dad don’t come and yell at me. Let’s all hope they aren’t reading this, because things are about to get out of control. I took my favorite donut and did some ridiculous voodoo ice cream magic to it. You guys are going to hate me for this easy, addictive recipe! 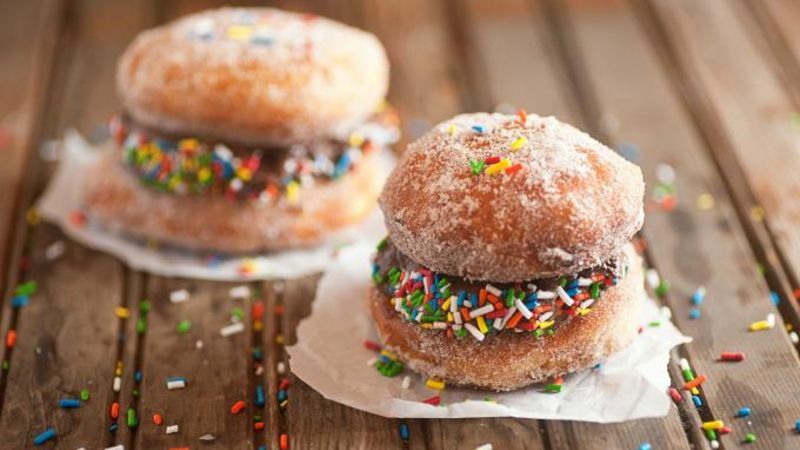 Let's make ice cream donuts sandwiches, k? First up, grab yo' crescent roll sheet of dough. If you don't have a biscuit cutter, don't freak out. I used a Mason jar lid to cut out my circles for these donuts. I'm so crafty. Fry your biscuits up in some hot oil until perfectly golden and all you can think about is dipping your face right in the hot oil to get at the donuts. But don't do that because it's true – hot oil is hot. Toss your fried dough in some cinnamon and sugar. Then do it again, because you're an adult and if you want extra sugar you can have extra sugar. Now, here comes the ridiculous part of this experience. Take some ice cream (any flavor will do!) and plop it right on your donut. You can either do this when the donut is still warm or wait until it's cooled. I recommend you try it both ways. The warm donuts with cool, melty ice cream is heavenly and probably my preferred method, but I may need to do another round of taste testing to be sure. Don't forget to load your ice cream up with some chocolate syrup, caramel sauce, and sprinkles. I mean, if you're going to do ridiculous things, you should do them right. You can also roll the edges of your ice cream in sprinkles. Mo’ sprinkles, mo’ problems. Enjoy these, guys. But don't come yell at me if you're suddenly addicted to donut ice cream sandwiches.